Do you want to change the look of your backyard without investing too much time, effort, and money into the process? Are you afraid that your backyard might get invaded by weeds and you want to prevent that from happening? Then you’ll be happy to find out that you can do that by planting some ground cover plants. Ground cover plants, as the name suggests, are different types of plants that you can use to cover your backyard or lawn and protect the soil without too much trouble. Today, we’re going to talk about 5 types of ground cover plants and a few of the benefits of growing them. If you’re looking for drought tolerant ground cover plants, then thyme is definitely one of the options you should consider. It has woody stems, it emanates a lovely fragrance, and you can grow it in borders, beds, and even containers. The great thing about thyme is that it’s also part of the category of ground cover plants that you can walk on. Still, we recommend you to try to avoid doing this if you can. 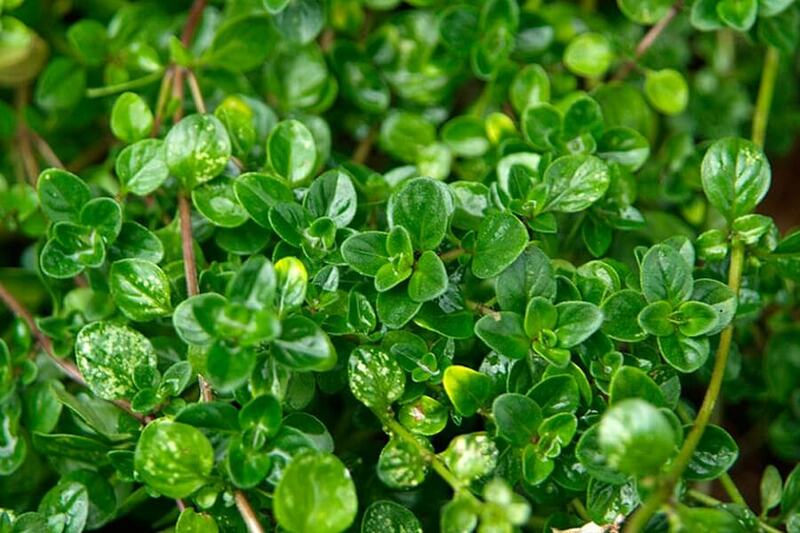 Thyme requires a lot of sunlight and a well-drained soil to develop properly. If you’re interested in buying thyme seeds, you can check it out. 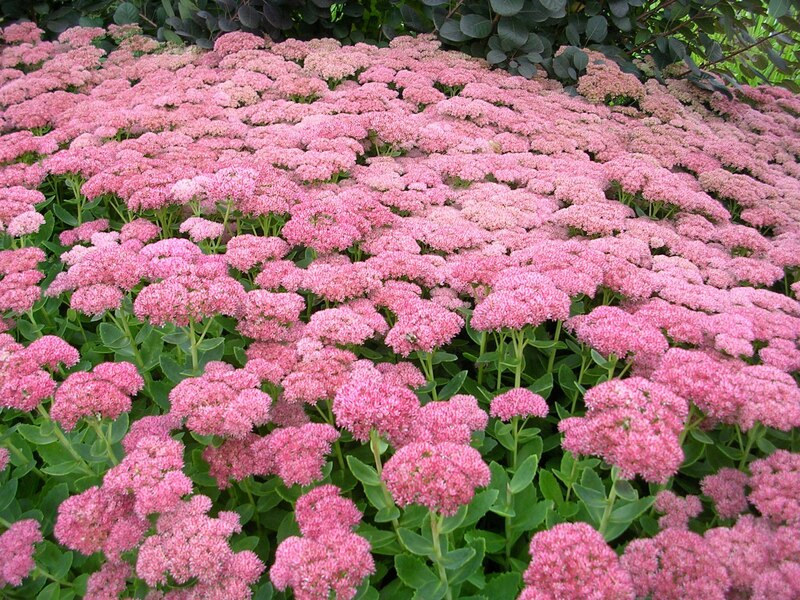 Sedum is another type of ground cover plant that is tolerant of drought. It actually thrives in places with low-water, having succulent stems and leaves. It doesn’t grow too tall, but it’s quite dense, which makes it a great cover plant. The blooms will bring a touch of color to your backyard, depending on the variety you choose. You can get white, red, pink, yellow, purple, or orange blooms. Even though sedum adapts rather easily to almost any type of weather conditions, it develops its best when planted in areas with a lot of sunlight or partial shade, and where the soil is well-drained. Check it our here.here. 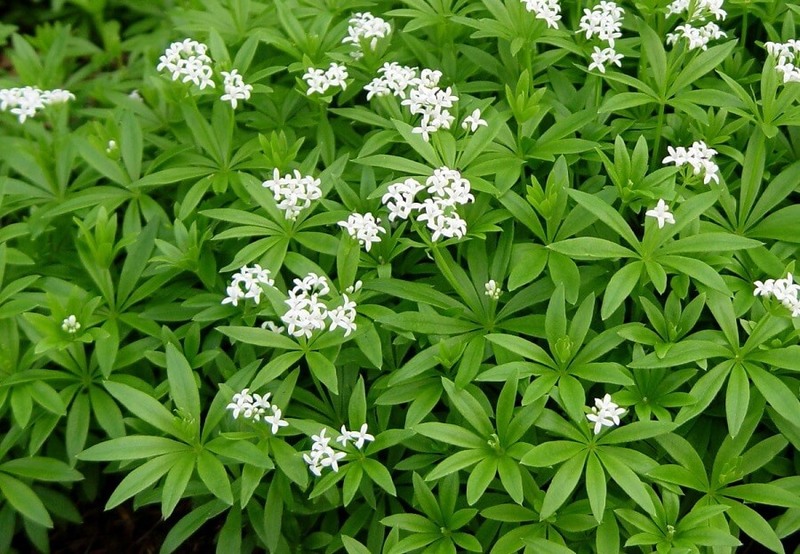 Sweet woodruff is one of the most shade-tolerant ground cover plants that you could grow in your garden. 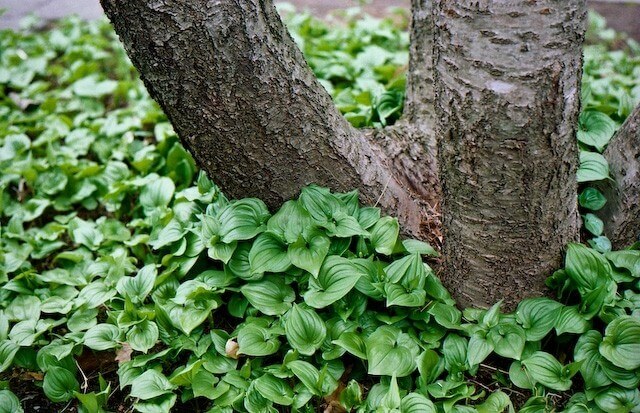 This plant can develop even in areas with dense shade, so you can plant it under shrubs and trees as well. It can grow up to 12 inches, forming clumps of upright stems with green foliage. The foliage is deciduous, so it sheds annually. Sweet woodruff also grows lovely flowers which are white and tiny. You can check them out. One of the most popular varieties of ground cover plants, bishop’s weed is part of the category of ground cover plants for slopes. That doesn’t mean that you can only plant it on slopes, because it actually also works pretty well in large areas where it can spread freely. The most important attribute of bishop’s weed is the fact that it grows extremely fast, even if you plant it in shaded areas. You can also grow it in smaller areas and contain its aggressive growth, such as in between a sidewalk and a building. Make sure to snag them. If you’re looking for ground cover plants which won’t only protect the soil in your backyard, but also bring some beauty to the entire area, then you might want to consider growing some aruga varieties. These plants are easy to maintain and control. Plus, you can even grow them in places where you know you’re going to walk through every now and then. The attractiveness of the ajuga plant is in its flowers, which can bloom pink, blue, white, or lavender. Even without the flowers, this plant is still gorgeous to look at. Its foliage can be bronze, maroon, purple, green, white, or even pink. It can reach between 4 and 9 inches. Check them out here! Another great option to cover your backyard or lawn with are evergreen cover plants. For instance, brass buttons is a low growing ground cover plant, reaching only 3 inches. Its foliage is feathery and quite textured, and it can come in different shades, from purple-gray to bronze-black. Its blooms are also lovely, usually yellow-green, and shaped like tiny buttons, which explains the name of the plant. Brass buttons blooms from late spring up to early summer. You can grow it both in places where it gets full sunlight and in areas with partial shade. Moreover, it thrives in soil that is moist, but that drains well nonetheless. 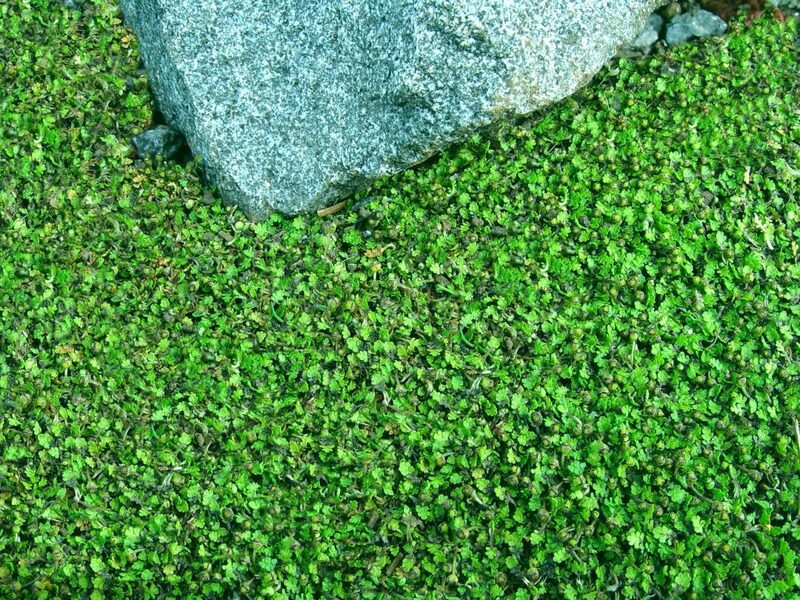 Even though the name and appearance of this ground cover plant can trick people into thinking it’s actually a type of grass, that’s absolutely false. However, it does grow strappy, slender, and sometimes multicolored leaves. They can go from different shades of green to multiple shades of black. Depending on the type of mondo grass that you plan on growing, you should know that you can get leaves that grow as little as 3 inches and as much as 24 inches tall. 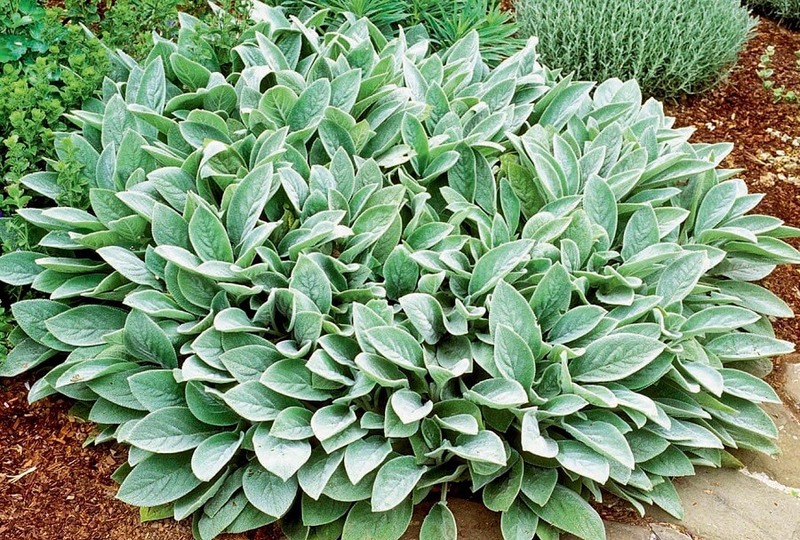 This plant develops nicely both in areas with full sun and in areas with partial shade. Moreover, it thrives in moist soil. Usually, people use it as edging. You can find it here. This funny sounding type of ground cover plant gets its name from the texture of its fuzzy leaves. This is a type of perennial that you can grow in full sun and partial shade. Its leaves are silvery-green, and its flowers can bloom in a multitude of colors, from pink, to white, violet, purple, and red. They’re quite tiny, and usually bloom in the summer. Since the leaves of this plant tend to be the main attraction, you’re free to cut off the blooms and only keep the leaves. When the weather is too hot, you’ll notice that the leaves look as if they’re about to melt away. If this happens, don’t worry – they’ll go back to their natural state once the weather gets cooler. Pick some up now! One of the most important benefits of growing ground cover plants is the fact that they prevent the soil from getting eroded. Especially if your backyard or lawn has steep slopes, you understand how difficult it can be to grow something on this type of soil. 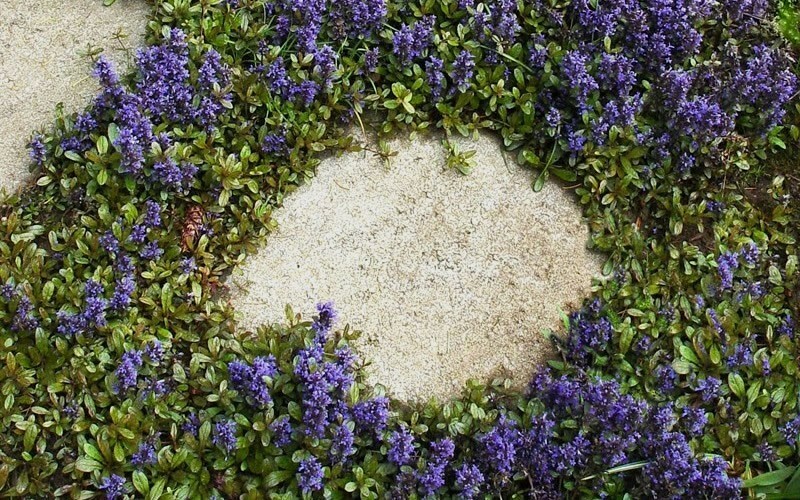 This problem is solved by ground cover plants, since they require low-maintenance. You can basically just plant them and only check on them very rarely. You don’t even have to worry about watering them, since they’re water resistant, thus controlling the erosion of the soil. Not only do ground cover plants protect your soil from erosion, but they also guard it against weeds that might take over if you don’t plant anything for a while. Most ground cover plants are extremely dense. This means that weed seeds will be unable to germinate, as there’s literally no more room for them to grow in. 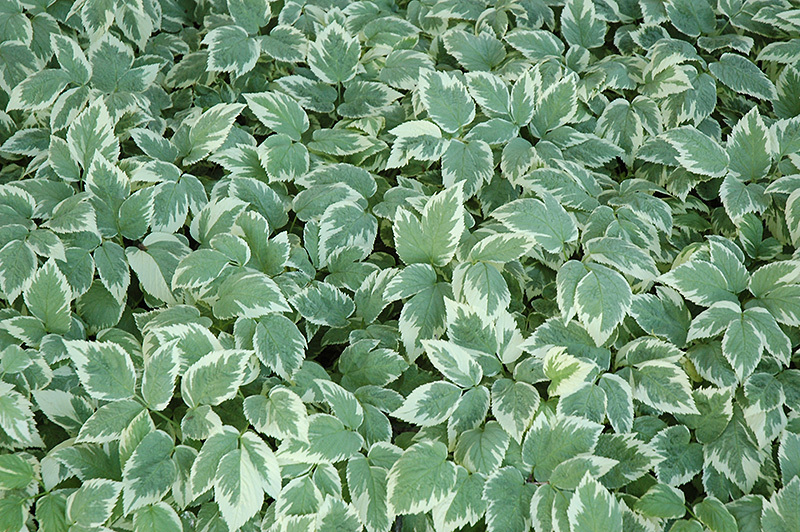 Ground cover plants don’t need a lot of water or fertilizer. They are in themselves an insulating cover and a type of mulch for the soil. This means that in the summer, they keep the soil cool, and in the winter, they keep it warm. Thus, they don’t only save you a lot of maintenance efforts and costs, but they also retain water, which decreases your water consumption. 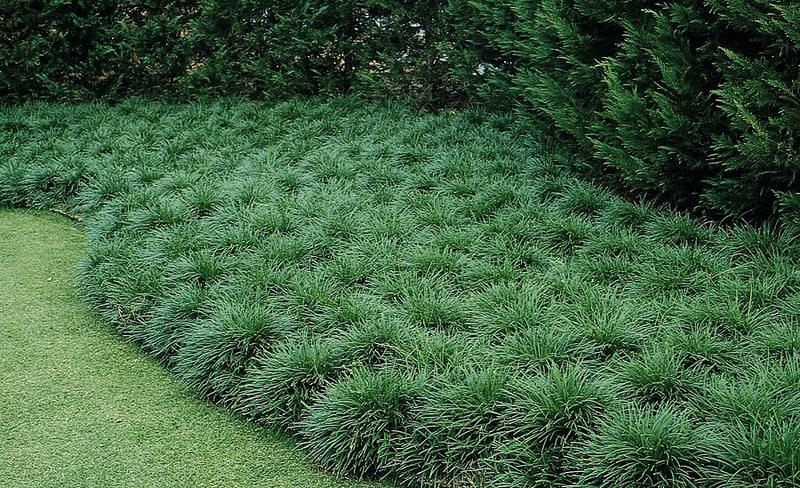 A lot of people prefer to grow ground covers instead of lawn, because the latter is much more high-maintenance and expensive to take care of. In order to grow a successful lawn, you need a lot of water, constant attention, and the use of lawn mowers, pesticides, herbicides, and so on. This is not only much more expensive for you, but also much more damaging to the environment. A single household consumes about 60 gallons of water each day to take care of the lawn. Plus, pesticides and herbicides are known to be toxic. By allowing them to seep into the water we use for the lawn, we run the risk of them infiltrating water streams. If you’re worried that your backyard is going to get invaded by pests if you don’t plant anything in it, then some ground cover plants are your safest bet. They help keep away pests, but also protect the ground from frosts and act as a fire retardant. Ground covers are usually rich in pollen and nectar, thus acting as great pollinators for bees, butterflies, and birds. These tiny creatures are attracted to the wonderfully colored blooms and the sweet nectar of the plants. This means they’re going to visit your garden all year round. By planting ground cover plants, you don’t only help butterflies, birds, and bees, but you also support the ecosystem’s health as a whole. Finally, another really important benefit of ground covers is that they help you get rid of those annoying gaps between the stones in your pavement, or between the pathway and your house. Wherever you feel like your backyard looks patchy and unattractive, you can always plant some ground covers to help improve its look. One of the best things about most ground cover plants is that they can be used to fill in any existing gaps in your landscaping or cover up those places that may be left bare. You can easily use ground cover plants to fill in spaces in between paving stones or anywhere else where there is a gap in the landscaping. Unless you take the time to fully plan out your landscaping ahead of time, there are always bound to be small gaps or awkward spaces that are difficult to fill, which is where ground cover can be a huge help. In addition to bringing additional brightness and life to your landscaping, filling in any gaps in your landscaping with ground plants can also help you to avoid the bane of any gardener—weeding. By planting your ground cover plants in those gaps, you should be able to ensure that no weeds or other plants can grow where you don’t want them to. In this way, you can save yourself some work while also ensuring you’re not left to rely on toxic weed killers. If you live in a particularly hot or dry area, your plants will need all the help they can get to survive the summer. In this sense, ground cover plants can be a huge benefit by helping to ensure that the soil retains more water. Any soil that is directly exposed to the sun will obviously lose water more quickly due to evaporation. This leads many people put down a layer of mulch in between their flowering plants and shrubs in an effort to slow down evaporation. However, you can use ground cover plants in this exact same way. The fact that there are so many different species and colors of ground cover plants means that the sky is really the limit when it comes to landscaping with them. This means that they can be an invaluable tool in any situation where a homeowner isn’t fully satisfied with the look of their landscaping, but doesn’t have the money, time or patience to tear it all out and start over. Planting ground cover plants around the border of your flower beds, under your trees or in the gaps in your patio stones is a quick and easy way to brighten up your landscaping without having to resort to more drastic measures. If you have any steep banks around your property, you are surely already aware of how much of a pain they can be when it comes time to mow the grass. For this reason, you might want to consider replacing the grass on those banks with ground cover plants to ensure you never again have to worry about mowing them. In addition to this added convenience, the ground cover plants will also provide the extra benefit of holding the soil together to help prevent erosion from washing the banks away during heavy rains. Just because they are referred to as ground cover doesn’t mean that you have to use them on the ground. In fact, many homeowners have begun planting various ground cover species on the roofs of their sheds, gazebos and other out buildings as a way to add a further touch of color and character to their yard. Although you’ll generally want to ensure you choose a plant that is more tolerant of dry conditions, you should have no issues finding a wide range of plants that work perfectly in just this type of situation. No matter the reason why you want to grow some ground cover plants in your backyard or garden, we hope today’s guide has managed to provide you with some useful ideas and tips.